After a thrilling finish to the season-opening race at White Mt. 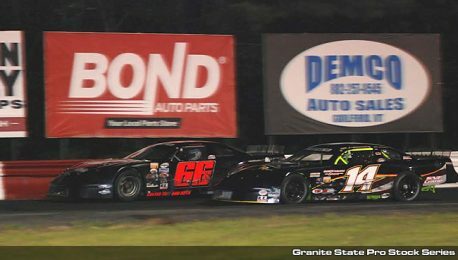 Motorsports Park last weekend, won by Jacob Dore, the Granite State Pro Stock Series (GSPSS) is ready for race two at Monadnock Speedway — this Saturday, May 28. The running of the Rydemore.com 100 lap feature will be contested on the high-banks of “Maddog,” a track that has proven to have intense Super Late Model action for the series each time they make the trip. Barry Gray, who finished second at the opener last weekend, is the defending winner of the Memorial Day weekend special and a four-time winner with the series on the high-banks. Other formers winners with the series at Monadnock include Matt Frahm and Mike O’Sullivan. Mike will attempt to capture another checkered at Monadnock Saturday, as will multiple other series competitors. The series welcomes Feura Bush, N.Y. driver Michael Scorzelli to the roster, along with many of the drivers who ran the opening race at White Mt., like Cory Casagrande and Mike Mitchell. Race sponsor Rydemore Heavy Duty Truck Parts Inc., located in Fitchburg, Mass., is one of the largest heavy duty used demanufacturing facilities specializing in quality used parts for commercial trucks, class 7-8. Fans can visit them on the web at www.rydemore.com. The winner of the feature event will also have a guaranteed spot in the open competition Seekonk Speedway 200 lap Pro Stock feature race scheduled for July 13. The race is being promoted by Gary Sagar and Kraze Krolacki Speed Equipment, located in Seekonk, Mass. and is expected to draw drivers from all across the East Coast, meaning a guaranteed spot could be crucial to success. Joining the series at Monadnock will be the Sportsman Modifieds, Super Stocks, Mini Stocks, Lightning Stocks, Thunder Stocks and Young Guns — all of the regular NASCAR divisions at the 1/4 mile oval. Heat races begin at 6 p.m., with feature racing to immediately follow. Admission to the pit area is $35 and general admission tickets to the grandstands are $20, with those 12 years and younger free of charge to watch all the action. GSPSS practice at 3:30 p.m.
GSPSS practice approx 5:15 p.m.
GSPSS heats last in order; approx 7 p.m.
GSPSS feature last in order; approx 8:30 p.m.